What Kind of Match Would You Like to Try? Major construction in the arena is done, and now I'm setting up supplies shops and storage inside the "Grove". I am ready to begin hosting matches inside the arena. There are also rule books in the chests in the "Grove". I'll post them here too. This arena is set up to handle four (4) different types of games: (1) Basic PVP, (2) Team PVP, (3) Team Objective Challenges, and (4) Fortress Defense. All three objectives are wired into the arena lights, so players can view how their team is doing. Colored leather armor is available to borrow for team matches. 1) No enchanted weapons or armor, with the exception of mending/unbreaking. 2) No potions, unless otherwise decided. Tipped arrows allowed (slowness and poison for sale in the Grove). 3) Iron armor for Basic PVP. Iron weapons for all matches. Colored leather for team PVP. 4) If you break or lose a colored leather armor piece, you must replace it or provide replacement materials. 5) Iron equalling one set of armor and normal arrows also on sale in Grove. 1) One team defends, one team attacks. Defending team sets their lights on. 2) A time limit is set. If attacking team manages to defeat and convert all lights to their color, they win. If they do not, defending team wins. 3) Once the attacking team changes a light, the objective is lost. The defending team may not change that light back. 4) For objective matches, the game ends when you convert all three lights or time runs out. For tower defense, only the top light must be changed. View of the far right of the arena (taken from the Grove). Ice field and ice spikes visible. Spikes are a form of cover. 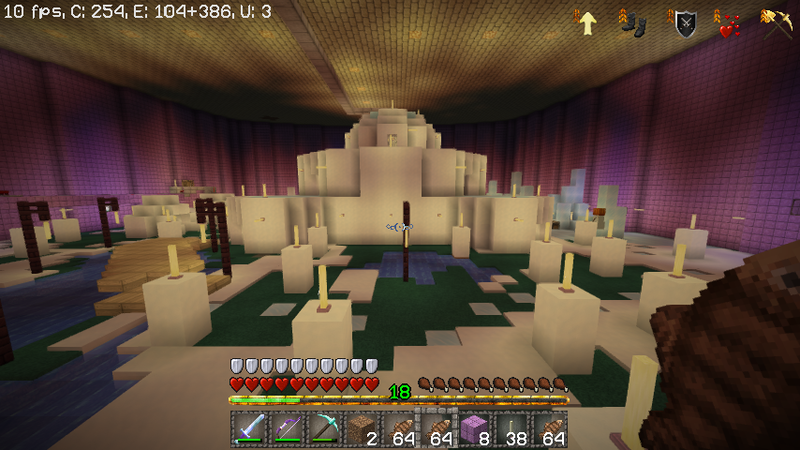 View of the fortress, and the lamps scattering most of the arena. Watch out for mobs, especially creepers-- part of the arena is still unclaimed. Lamps also serving as cover. View of the igloo field to the far left. More lamps and the pond with a wood bridge passing over it. Lookout station on far side of pond for optional "referee" to stay and look over the match and watch the lights. That aside, I'm asking: who is interested in participating in a match to launch this arena, and if so, what times are you most likely to be on. Also, please vote in the poll as to which match type you'd most like to try out. Can we select all of them? I would definitely be interested in joining some matches on most weekends. I'm sure everyone will have a chance to participate in however many variations they want to, but select the one that interests you the most . Also, check out the edit (near the top). Let me ask you guys. Should I amend the rules to Fortress Defense? In the team objective matches (including fortress defense), once a light is changed it cannot be changed back. This is fine for matches with 3 objectives, but in Fortress Defense, once the light is changed, the match is over. Should I change this rule to you can change the light back in Fortress Defense, and make the game end after one team can hold the Fortress for a time limit, not immediately after it is taken? Per the poll, the first match will be Team Fortress Defense. 1) Use team colored armor. 2) A team has to hold an objective for a set time limit to win the match. Simply capturing the objective no longer means victory. This is a modification from the original proposed rule. 3) Enchanted weapons and armor not allowed, unless something like Unbreaking or Mending, or Infinity. Iron weapons preferred. 4) Potions not allowed. Tipped arrows allowed (poison/slowness for sale in arena). I was thinking of hosting a match Saturday night, between roughly 8 and 10pm Eastern Standard Time. Would this time work for anyone who would like to join in? Anyone wishing to come before the match to help me sort and remove 2 chests worth of construction supplies from the arena is welcome to grab whatever they'd like from it, except for snow/ice/lighting. Due to being unable to assemble a group for matches the last two times I tried, I am going to try again this week. What days are people available to participate? I'm trying to organize a PvP match here, hopefully within the next few weeks. I'm assuming the poll above still stands for the match choice? Anyone interested in joining, what days are you free in the next week or so? I'll try to plan around what people say. Also, would the admins be willing to contribute prizes for this match, if we get a large enough turnout? &1) Iron armor and weapons only for normal, supplied colored leather armor for team pvp. Iron sold in arena, in quantities for a full armor set. &3) Tipped arrows allowed. Some varieties sold in arena. &4) For team objective challenges, a team has to hold the top (or all) objectives for a designated time limit to win the match. &5) For "mob mayhem" challenges, a death is a loss. However, you can still 'win' if your team wins, in team matches. Most of the time evenings are the best time for me, after 6pm est. Pending I'm not streaming my SSP world. Let me know what I can help out with if you need it! We could tentatively plan for next Tuesday, evening? If that works for you guys. Also, comic, if anything, leather and prizes (we'd need enough prizes for the team, since it looks to be that kind of match). Just to clarify. Leather? Like, cow hides or leather armor? I regret that I won't be able to make the tournament, I have a project at work that I'll be starting that day after I get out of class. So, please post results here in the topic and I'll take care of the prizes when I get home that night or a following day. 1v1 and best 2 of out 3 rounds. Such a tournament could see prizes for various accomplishments. Such as winning the event without dying would grant a rarer prize than just straight up winning. Anyways, best of luck to those who participate. I can't wait to read the results! Thanks! I'll be sure to record those stats. I may even record during the match too, if I can get my FPS to cooperate. Hopefully you'll be able to make a subsequent match. Also, just giving everyone a 1 day warning. Match tomorrow evening @ roughly 6pm EST. The time is fluid, depending on when people come on. So far, it seems we might have Little and tifreak. Hopefully I'll snag a few more before it starts. If you're interested, please either comment here or grab me in game. Also, grab a copy of the rules, available for free at Arendelle's bazaar plots. Current expected participation: stickybutton, Chauronslilsis, TurquoiseDrag0n, ACagliano, Master13uilder, ?tifreak?. Match Type: Team Fortress Defense. Time limit: 5 minutes. Team must conquer and hold the objective within the central fortress to win the match. Best of 3 to win. Equipment: Full iron gear, unenchanted (shields included). Iron sword and bow, unenchanted. **unbreaking, mending, infinity enchantments allowed**. No potions allowed. Tipped arrows ARE allowed. Some varieties are for sale in the arena. Prizes: A loot chest will be available for winning team to split. "Bets" being accepted to add to chest. We will be monitoring other achievements, such as least deaths, most kills, etc. Players with these achievements will be given prizes by admin, with rarity corresponding to difficulty of achievement. After much waiting, we finally got everyone (or mostly everyone) assembled to play. 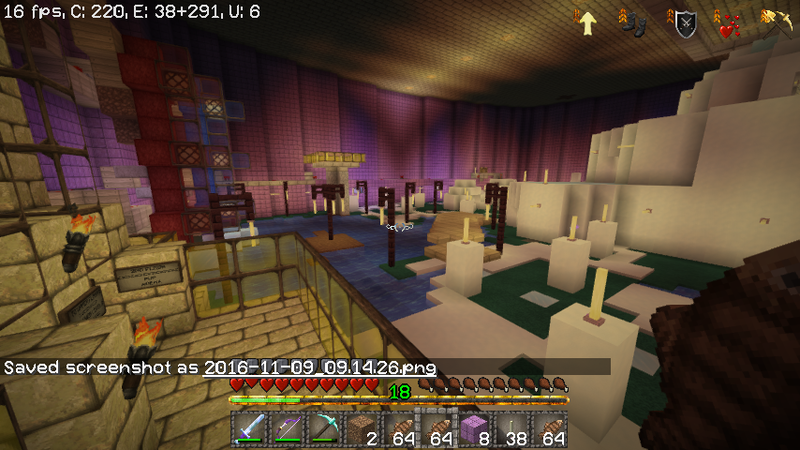 On the blue team was: Rivereye, tifreak, LittleMoonBeam, and Master13uilder. On the red team was myself, Chauronslilsis, and TurquoiseDrag0n. Despite some lag issues I encountered attempting to record, Minecraft, and Skype on a computer with 4g of RAM :/, the first round went off without a hitch. The game format became: 3 rounds, each consisting of a match with one team defending and then a match with the other team defending. As time went on and we saw what worked and didn't work, we ended up changing/adding to rules. I realized a few things... firstly I need a better system for players who get killed. tifreak sadly got attacked a few times while trying to recover his supplies. I was thinking about perhaps a few sets of orange leather to identify players not actively in the game. Secondly, I need better signage on the objectives of what to actually do when you get there. I also decided that, to keep matches interesting and to keep players coming back, and new players joining, I will change up the terrain within the arena from time to time. I've decided that the next arena theme will be a jungle. Vines, dense undergrowth, and lots of hidden passages. Demolition of the current arena, and reconstruction will begin within a few days, complete with a re-wiring of the lighting system. To see the complete plan for the new arena, and a description of the new style of PvP planned, scroll to the bottom. Thanks so much to everyone who put the time aside to join tonight! Thanks for a great game, and thanks for helping me work out some of the kinks in the design and the rules. I hope to have you guys back, and more joining, for the opening of the jungle themed arena! 1 v 1 Scavenger Hunt and Death Match. Hidden among the vines and dense undergrowth of the jungle are tons of chests, with various weapons and armor, and tools. Parts of the arena will even be charged with redstone current, and yes... TNT will be provided and allowed. Only two players may enter the arena at a time and must race to collect as much goodies as they can. They may not attack each other until 5 minutes has passed. After 5 minutes, they may continue searching, but they may also attack each other. The last player standing wins the match. For anyone interested in joining this type of PvP, you'd be paired off in groups of two, and the winner progresses, in round-robin fashion. Every match will have a reward for the victor. At the end, we could have an open match, a free for all, with the same format, but not limited to two players. I like the scavenger death match idea. I'm definitely interested in that (though I'm sooooo bad at scavenging). I enjoyed it too! Could've used a bit more organization tho. To that effect, I finalized plans for the new tournament, and this will even allow players to come over and battle when the match hosts aren't online, which should let players unable to make a single-time match be able to join. - after every team of players finishes their 1v1, there will be a large match in any format... PvE, Capture the Flag, etc. This match will allow standard iron gear, weapons.. like the last match I hosted. Players or teams that win get extra points. - when every team of players interested in participating is finished, the round ends. Players with points equal to or greater than 4 times the round number move on to the next round. When we finally hit the last two, maybe an admin can toss out of pair of elytras or totems or uncatchable spawn eggs, or something like that. By having a complicated, round-robin system, I can keep alternating tournaments and round-end matches going well into the future. I will be keeping score and posting every so often. Arena should be up and running in a few days. Anyone interested, post or tell me in game. There is now a betting station in the arena prep area! This is how it works! **Any player, even ones not participating in a match, may bet on a match. - You buy a piece of paper from the chest in the arena (please don't use your own paper, as possible as it is. Betting can make you money without trying to cheat the system.). It costs 50 denarii to bet. - Place the bet into one of the chests on either side of the buying chest. - At the conclusion of the match, you will win 75 denarii for every bet you have placed for the winning player(s). Breaking News: the arena is now open for business, with a new layout, improved prep area, simplified ruleset. The arena is prepped for its first death match. Simply pick a partner, and head over. I don't need to be online, just let me know the results! As an aside, on my private website where I host my calc projects and some other stuff im working on, I tossed in a subdomain where I share my minecraft designs, and also I'll keep updated stats for matches in my arena there. It's at http://caglianotechdesigns.com/minecraft. Server ip is listed there as well. Planning to have another match in the jungle arena this upcoming Tuesday, February 14th, at 7pm EST. Match format to be decided. If you want to participate, hop on around 6:30/6:45 and head over. Also, anyone who can, please let me know in advance. Breaking News: the arena is now open for business, with a new layout, improved prep area, simplified ruleset. The arena is prepped for its first death match. Simply pick a partner, and head over. I don't need to be online, just let me know the results! <== new death match format also available, for less hectic matches. © Copyright 2000-2019 Cemetech & Christopher Mitchell :: Page Execution Time: 0.139154 seconds.